Ousted Nissan boss Carlos Ghosn said he was innocent and slammed former colleagues whom he accused of backstabbing and conspiring against him, in a pre-recorded video that marked his first public message since his arrest last year. Prosecutors took the highly unusual step of rearresting Ghosn on April 4 on fresh allegations that he used company funds to enrich himself to the tune of $5 million (¥556 million). The once-feted executive had been out on ¥1 billion bail for 30 days, during which he recorded the video shown by his lawyers to reporters at the Foreign Correspondents’ Club in Tokyo on April 9. 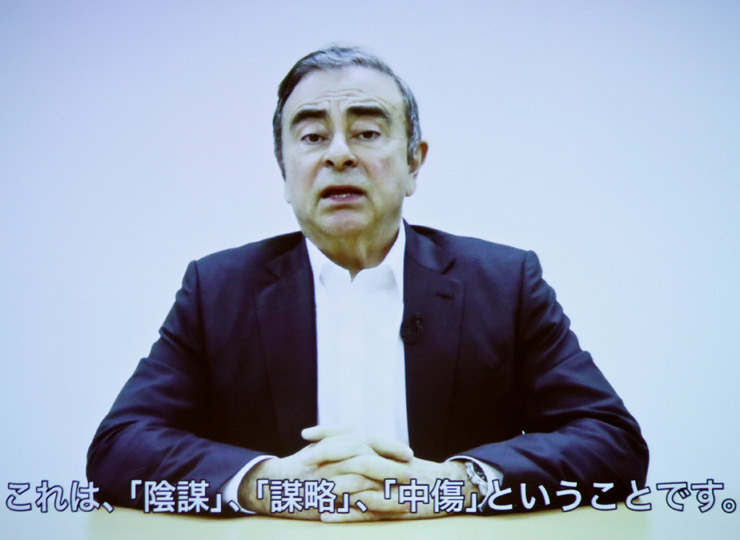 In the video, the former Nissan Motor Co. chairman said he was the victim of selfish rivals bent on derailing a closer alliance between the Japanese automaker and French partner Renault SA. Ghosn called out some individuals by name in the video but those references were removed due to legal concerns, his lead lawyer Jun­ichiro Hironaka told reporters. “This is a conspiracy … this is not about dictatorship, this is about a plot, this is about conspiracy, this is about backstabbing,” Ghosn said.